Mobility is the new face of business. Application-driven mobile devices are dominating the computing world, and it’s making productive work easier to accomplish on the go. These smartphones are more capable of complex computing, but also consume users’ attention. For this reason, smartphone manufacturers try and create their devices with specifications and capabilities the others don’t have. This competition has been driving mobile device proliferation forward, but over the last fiscal year, you’ve seen most manufacturers begin to focus on software rather than the hardware of the phone. This is because most manufacturers have access to relatively identical hardware. Variables like battery life, camera, and form factor have become the selling points for many devices. Apple’s iOS and Microsoft’s Windows Phone 8.1 have made improvements, but the Android OS’ popularity is overwhelming. 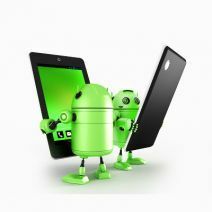 Over 80% of all smartphones in use today come equipped with some kind of Android OS. Here are five of the top Android-based smartphones on the market right now. The Galaxy s5 continues Samsung’s trend of improving on the devices they manufacture to stay a step ahead of their competition. This version improves on the Galaxy s4 by making the device lighter, improving the display, and adding IP67 certification (water & dust resistance). The guts of the phone include a 2.5 GHz Qualcomm Snapdragon 801 processor and 16 or 32GB of onboard storage. The phone runs Android KitKat with the Touchwiz skin on top and comes in copper gold, shimmery white, silver, and blue. The latest LG flagship device has only recently been made available, but if the buzz is accurate, it may have the best display ever produced in a smartphone. With a whopping 5.5-inch screen with a pixel density of over 530 pixels per inch, the G3’s display is very impressive. Like the Galaxy s5, it comes with a 2.5 GHz Qualcomm Snapdragon 801 processor, 2GB of RAM, and 16 or 32GB of onboard storage. One amazing feature of the G3 is the form factor of the device. Despite its enormous display (5.5-inches) the device isn’t much larger than its direct competitors. If you are looking for a phone to consume media, LG’s G3 is a great choice. The HTC One M8 has arguably the best build quality of any Android smartphone. Made mostly of metal, the One M8 offers a bulky option that comes with many of the most dynamic specifications available for an Android smartphone. The One M8 has an industry-best sound system, with a pair of front facing speakers that aren’t available on other manufacturer’s flagships. With the combination of superior build quality and top-of-the-line specifications, the One M8 gives HTC a flagship Android device that can compete with Samsung and LG’s top handsets. Occasionally a smartphone is created by a manufacturer that gets rave reviews and people have a hard time finding the device on the major carriers. The Sony Xperia Z2 is just that kind of device. Not currently available on any of the major carriers in the United States, and it’s a shame. The Xperia Z2 is one of the highest rated Android-based smartphones available today. Built of front and rear glass, the phone features a 5.2-inch display and IP67 certification. Sony has integrated options for some of their other devices including the Playstation 3 and 4 gaming systems. An unlocked version of this phone is available for the full retail price. The newest Google smartphone, the Nexus 5, is manufactured by LG. It is probably the world’s best smartphone value. The 5-inch, full 1080p-capable display on the Nexus 5 is a display that you’d normally find on a more expensive device, but Google’s adherence to supplying value has kept it at a lower price point than the other flagship devices. LG has replaced the full glass design of the Google Nexus 4 with a hard plastic bezel and a soft-touch backing that makes the device seem a bit less fragile. This pure Android experience provides users with additional customization options. The camera and speakers leave something to be desired, but for the money, you can’t beat the powerful and attractive Nexus 5. The Android OS has allowed vast commercialization of the smartphone for people all over the world due to it being an open-sourced software. At Tektonic, we understand how important the smartphone is to our clients. That’s why we offer mobile device management solutions to help your organization keep your company information safe. We can also help you implement a bring-your-own-device (BYOD) strategy in place that allows employees to access company files on their personal smartphone. For more information about the newest tech trends or mobile device management, call us today at (416) 256-9928.